Summer summer summer time! Time to sit back and unwind. Ha! Yeah, there had not been much unwinding going on these days! I feel like this is my first real week of summer. Which means, I have stayed home for a whole week! Can you believe it? 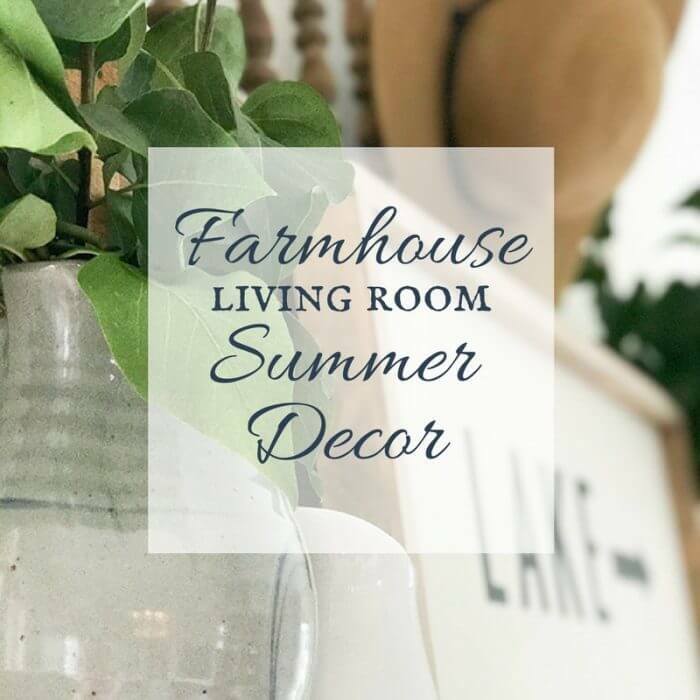 I decided to take some of the time to spruce up my farmhouse living room and today I wanted to share some farmhouse living room ideas for the summer. With all the craziness this room had been neglected, and had become the storing space for neglected dressers and other furniture pieces. Not what I would imagine when you think of living room decorating ideas. So, I put in a little elbow grease for the summer and gave this living room a complete facelift. I am super excited to show you what it looks like now! 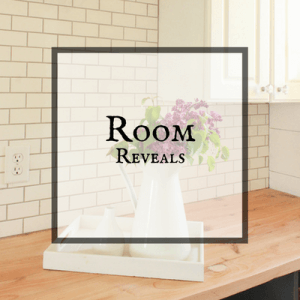 And I am excited to be linking up for the Room by Room Summer Showcase, where a bunch of bloggers are showing off their living room summer decor. Make sure to check out the links at the bottom of my post to see the rest! 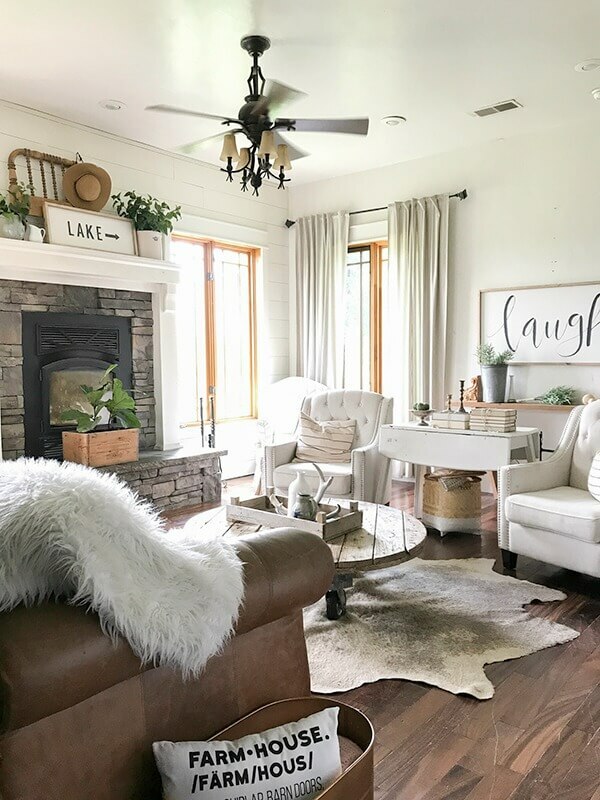 Lets talk all about farmhouse living rooms and what you can do to add more character and charm to your home, even in the summer. 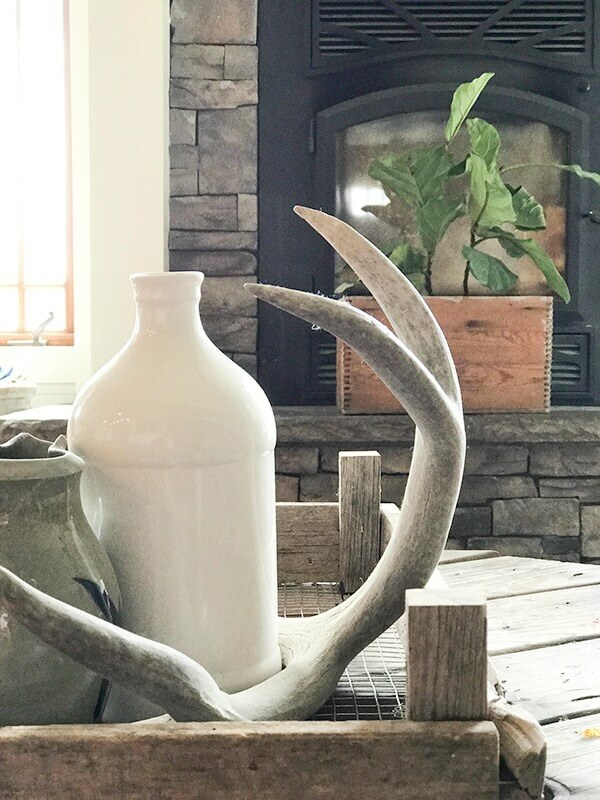 I started with the perfect farmhouse living room paint color, Antique White from True Value. This is a off the shelf color and its a great base. 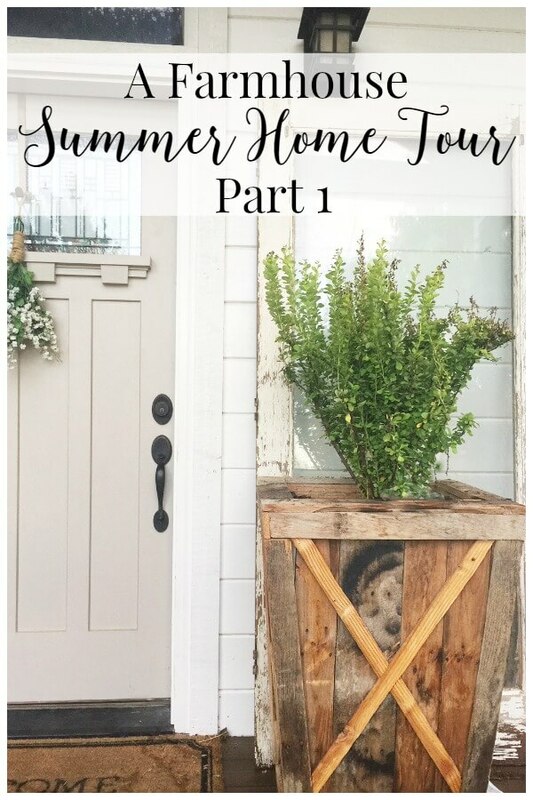 For my farmhouse living room summer decor, I really wanted to focus on adding a bit more blue to my the space. 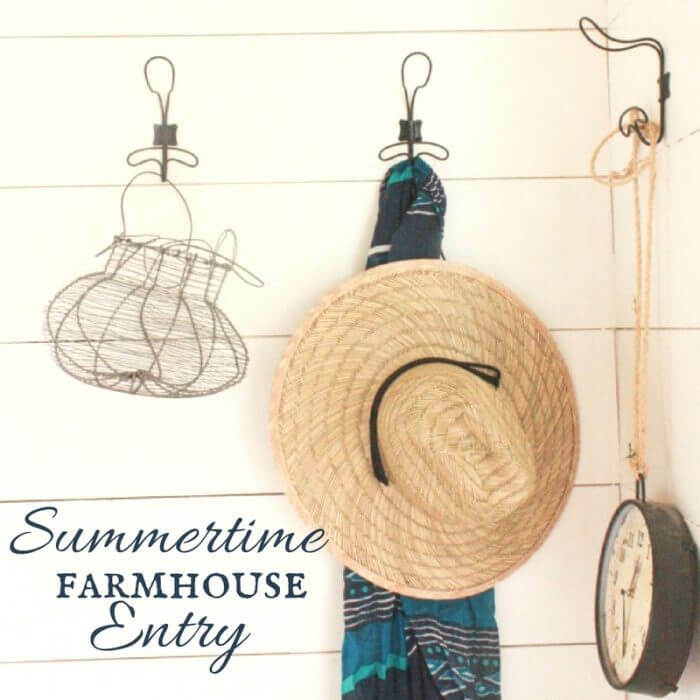 I also did this with my summer inspired entryway. Blue may be my color this year. 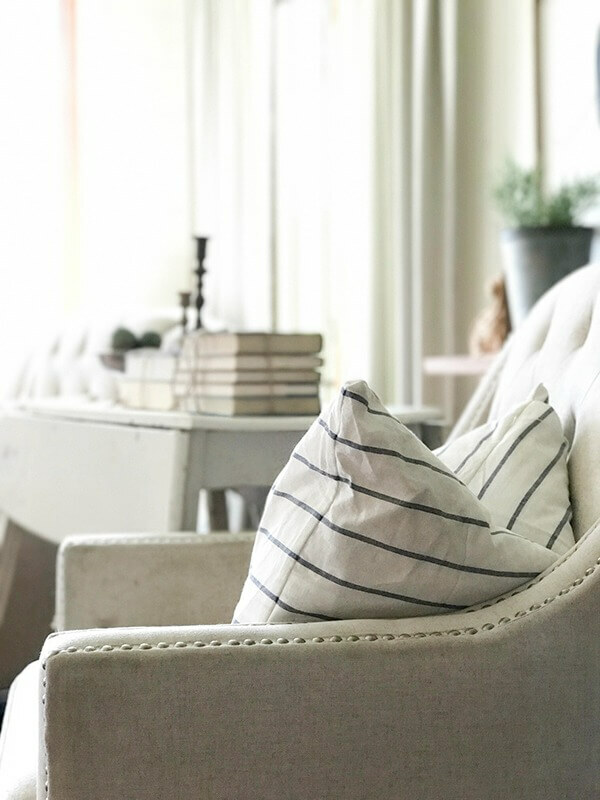 I still am a huge fan of white, brights, and neutrals, but adding a bit of navy blues, whether with striped IKEA towels turned pillows, or just pops of color here or there is my jam these days. 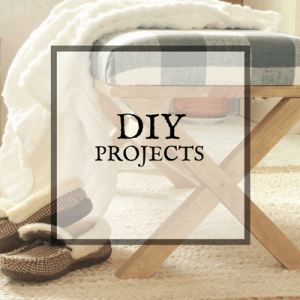 Some of my farmhouse decor items are recycled from other rooms and some I made just for this space. 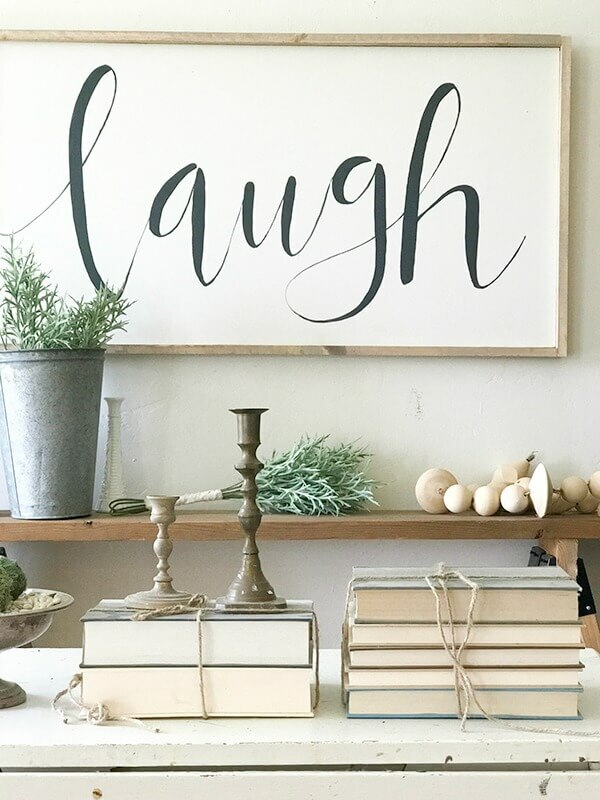 I started by using my large farmhouse “laugh” sign as my inspiration. I centered my occasional chairs around it, making sure to pull them out from the wall. I love adding cozy living furniture to my rooms. If you cant be comfortable in a room, why even decorate it that way? One of my pet peeves is when all the furniture is pushed up against the wall. Create a conversation space where people can congregate and enjoy time together. I added some navy blue striped pillows as a way to introduce a little more of my favorite color. I think navy blue is a great compliment to the farmhouse style. Navy is after all, a perfect neutral. I topped one of my tables with some bound books as a simple way to decorate. No money spent! 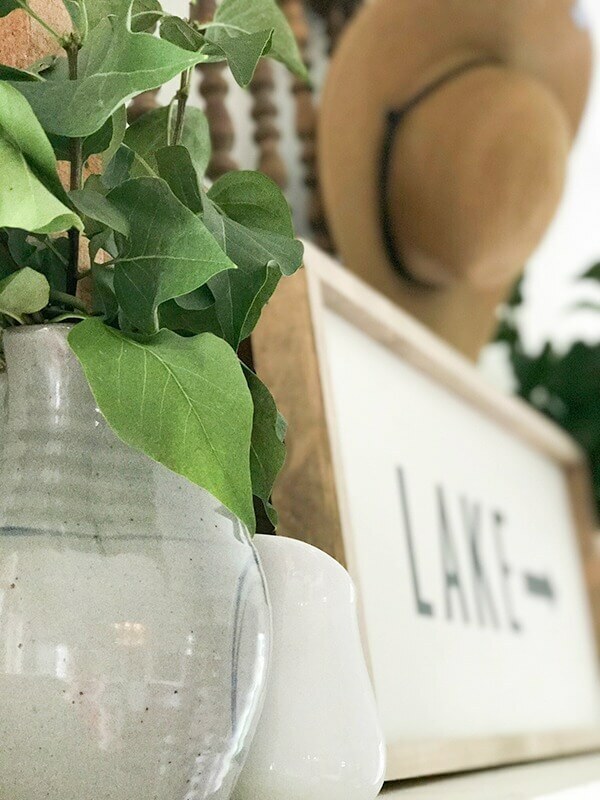 I also included some of my favorite farmhouse style candlesticks. Another quick 10 minute project. These are all easy living room decorating ideas. It does not take much to create a farmhouse living room. This one imparticualr for the summer. However, there are so many things in here that can transition into fall and winter. Did I mention that I am trying out a new camera and I am loving it!! We will see what else it can do! 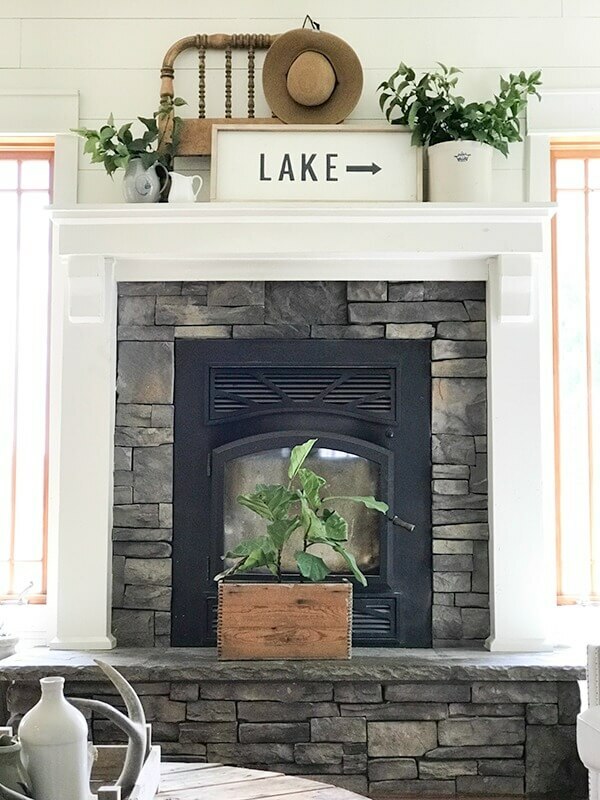 I often struggle with what to do with my fireplace and mantel through the warm season. I had recently taken down an old antique bed from my great grandfather that I had set up in my bedroom. I thought the headboard and foot board would look so cool just as decor on the walls for a bit and found that I really liked having one on the fireplace. 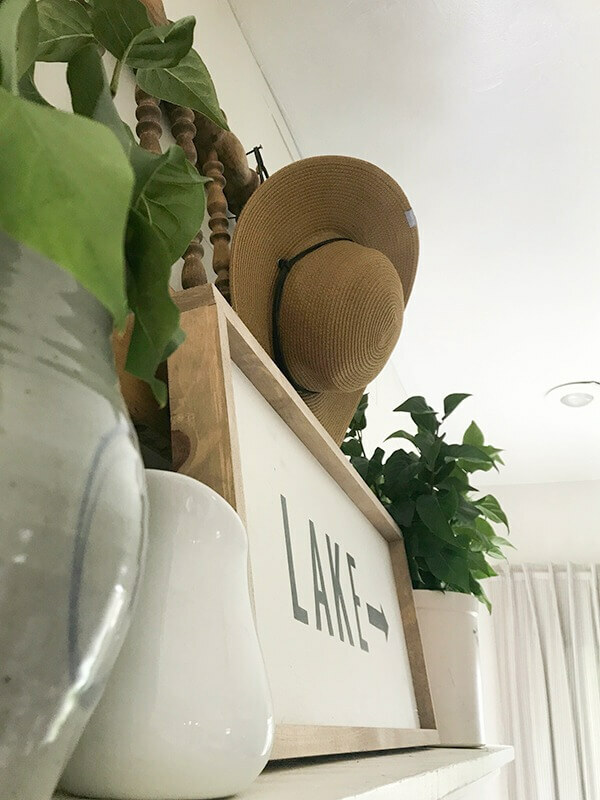 I combined the headboard with my LAKE sign, some lilac cuttings, along with my most recent acquisition, a handmade Amish pitcher. The potter in me swooned when I found it in a little shop in Pennsylvania a few weeks ago. I find keeping it simple is best. I love seeing the ribbing on the pottery. As a potter myself, I know the feeling of those ridges as you create apiece and take it from mud, to a piece of art. Gosh I miss the days when I could spend hours throwing pottery on the wheel. If only I had a place to do this again. I cant even imagine. The light in my family room was particularly lovely this afternoon. With thunderstorms rolling in, I was surprised to get such a lovely glow, and maybe that is what made it so great today. Some days I really struggle to take good photos in this room. Its either dark or washed out with too much light. You have to hit it just right in order to get a good picture. I can’t do without my fiddle leaf fig, or my found deer antlers. They kind of follow me from room to room. Always adding a touch of freshness with the greenery and earthiness….is that a word? Haha Fiddle leaf figs are quite easy to take care of. I have found that I just need to be diligent in watering them or else they will get extremely mad at you! 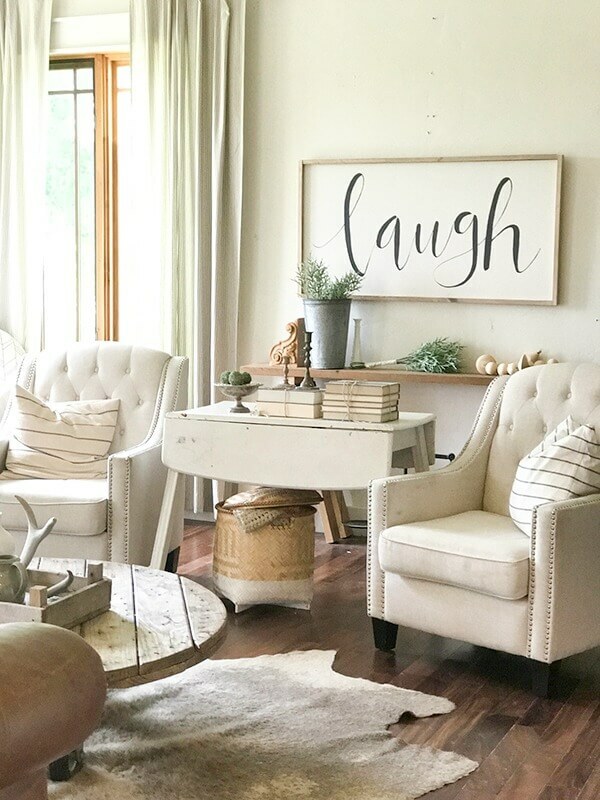 I am really digging my farmhouse living room summer decor. The room feels fresh, and now summer can officially start for me! 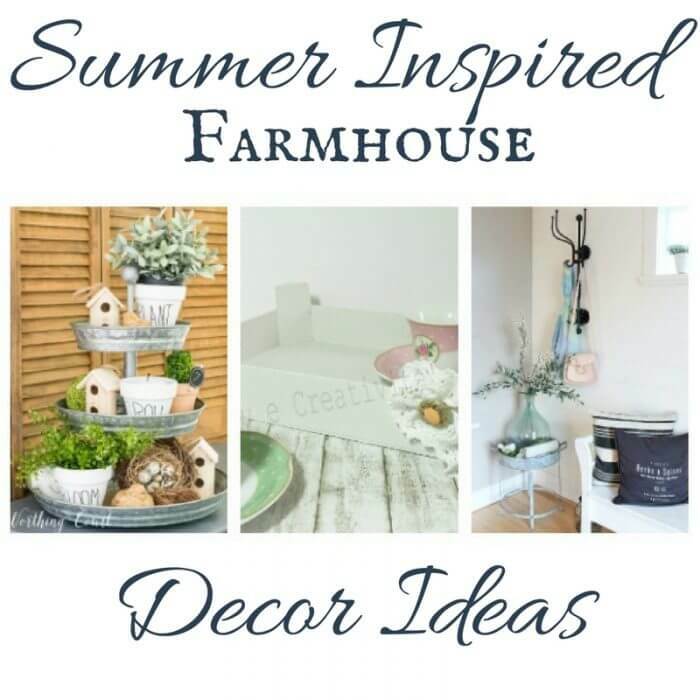 I hope you enjoy these farmhouse living room decorating ideas. 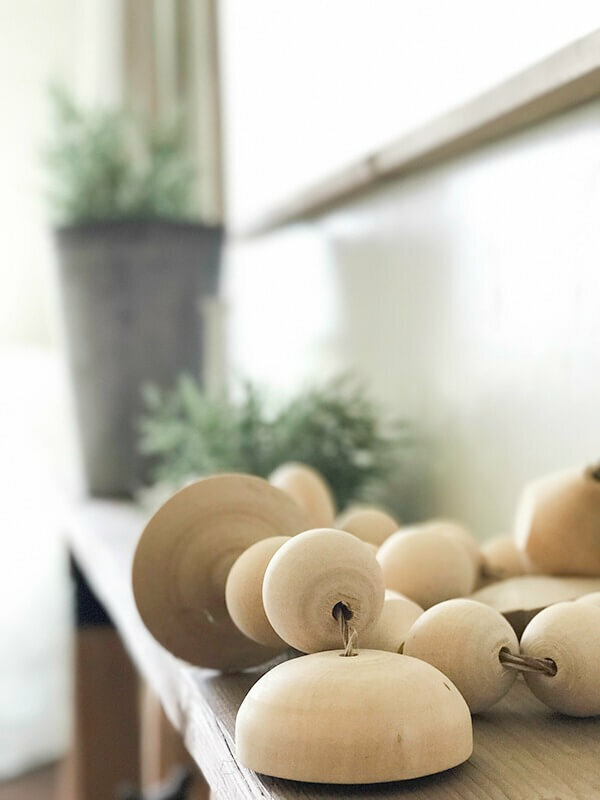 I tend to keep it simple and cozy…and you never know, it could look completely different next week. Not just because I change things around, but because my kids are constantly moving and rearranging things in my house. Now, I want to ask you to do one thing! 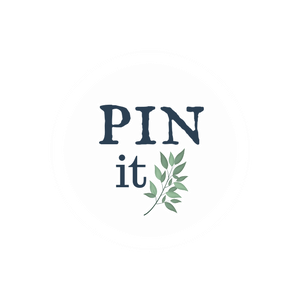 Will you please share this post on your Pinterest or Facebook? 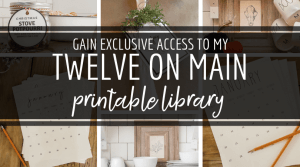 This is how I get reshares and get traffic that keeps this website humming along! Now check out all the other great summer living rooms below! If you like this post, check out these ones! I just absolutely love your style Sara! Beautiful living room! 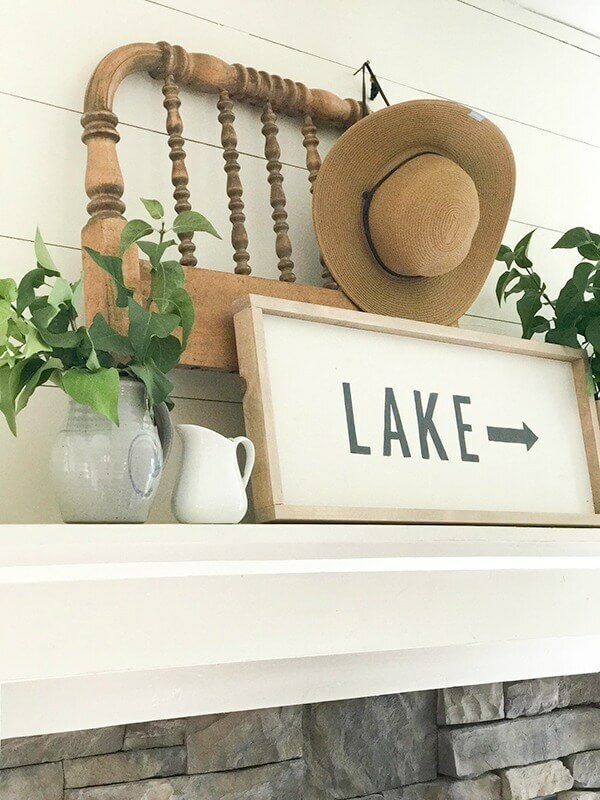 As always, your farmhouse style is spot on! I love this space and it makes me want to curl up on a stormy day and read a book. Beautiful! I find it interesting that you have drapes on one window (that I can see in the photo) but not on the window just to the right of the fireplace. Is that a safety decision? 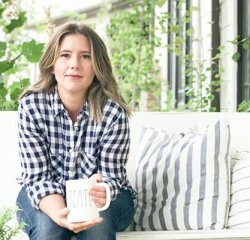 I always get so inspired when I see how you’ve decorated and styled your spaces, Sara! 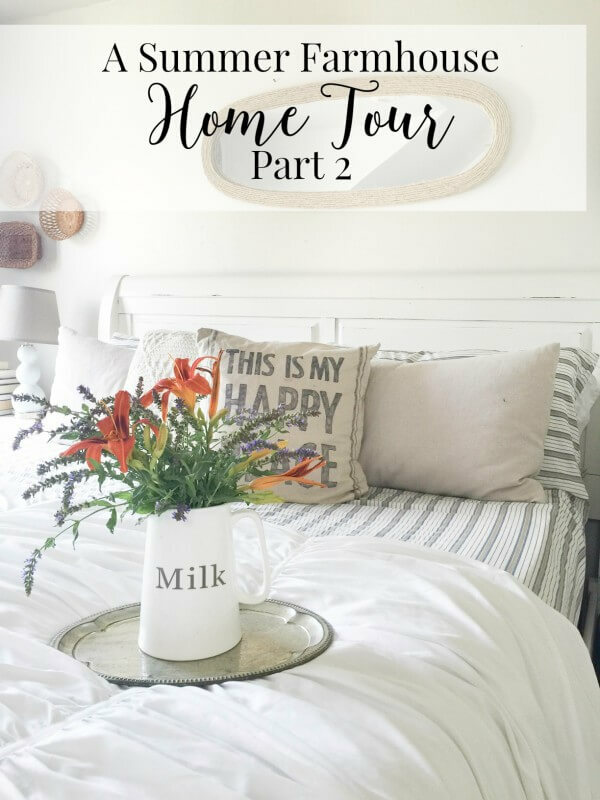 Love your mantel – especially with the antique headboard and handmade pottery! Gorgeous space! You have such an eye for design! 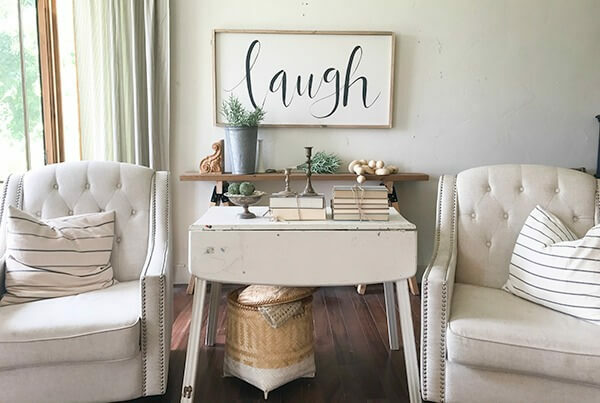 I love the “laugh” sign and your farmhouse style is perfection! Gorgeous home! Where did you get your accent chairs? I love them! Hi there! I got them from Lamps Plus. Beautiful living room !!!! Thank you so much ..